If you search your ancestors in Roccamonfina, Campania, info about your Italian family are stored in the City Office archives or at the parishes. In towns and villages of Campania and in Caserta province registry offices were established in early 1800: it means that you could find information in Roccamonfina registrar as of that date. So, if your ancestors were in Roccamonfina in the nineteenth or twentieth century, then you could try to contact the City Office of Roccamonfina to know more. 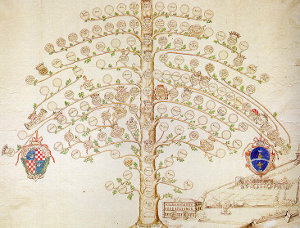 Before to start your genealogy research in Roccamonfina, we suggest you to read our tips for your search . They are useful to search in Campania and in Roccamonfina too. 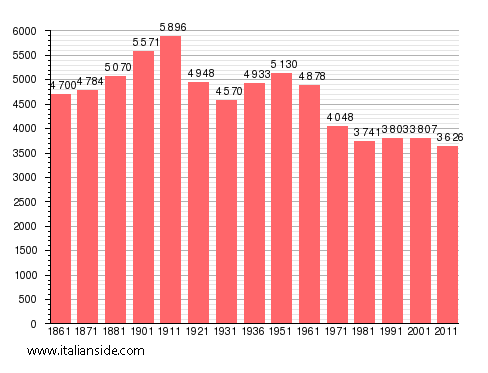 Next picture shows the demographic trends in Roccamonfina from the Italian Unification (1861) an important info to understand how many people lived there in the past. It could be important to know if the last name you are investigating is a frequent surname in Roccamonfina. As more your surname is common in Roccamonfina, as more it could be difficult to find the right info about your ancestors in Roccamonfina archives if you have not exact dates. Barbato, Colella, Conte, Coppola, Corvino, Crisci, D’Angelo, De Lucia, De Rosa, Di Nuzzo, Diana, Esposito, Fabozzi, Farina, Ferrara, Ferraro, Fusco, Gallo, Guida, Iodice, Izzo, Letizia, Lombardi, Marino, Martino, Mastroianni, Merola, Mottola, Natale, Pagano, Palmieri, Papa, Pascarella, Pellegrino, Piccirillo, Piccolo, Piscitelli, Raucci, Ricciardi, Riccio, Romano, Rossi, Russo, Salzillo, Santoro, Schiavone, Tartaglione, Vitale. Church archives in Caserta province may instead contain even older information, but they are far less accessible from abroad (and almost impossible by email). Then,parishes send information not easily. If you have the opportunity to visit Roccamonfina and Caserta province, you could plan to investigate churches’ archives by yourself, but from abroad is very difficult to obtain any result unless you find a reliable local help. If your research is in a dead end and you need professional help from our local Italian genealogists write to roccamonfina@italianside.com our expert in Roccamonfina area will study your request and will reply to you with a research plan and a quote. Hello! I am searching for information on my great-great-grandfather, Antimo Sciacca. He was from Roccamonfina and was born around 1875. I’d appreciate any tips on how to begin my search. My great-great-grandmother, Consiglia Zannini, was also from Roccamonfina and was born around 1885. Thank you!! Hello- We are looking for any information that may have to do with Angelina Di Cunto. She is my great grandmother. She was born in 1881 in Roccamonfina (according to her traveling papers) and eventually made it to Vancouver, Canada. We have record of her being on the SS Lake Erie in 1905. She may have been married to Thomas Di Cunto or Gontes. Does this family have any relation to the DeStefanos or Iannalfos? Looking for any information on any of the families mentioned – living in Roccamonfina. Thank you! I am looking for more information about my paternal side of my family. My dad’s father is Salvatore Rocco who was married to Mary Lou Angelone. He was born and lived in Pawtucket Rhode Island most of his life and from what I know his family cams to RI from Roccamonfina. Any information would be great! Hi Nicole, Is your great grandfather’s name Anthony…his wife was named Bertha? Was he a barber in Pawtucket, RI? Did Salvatore have a sister named Dolores? If so, your great grandfather was my grandfathers’ brother. My grandfather was named Steven. I visited Uncle Anthony and Aunt Bertha many times…even went to see the Pawtucket Indians (Boston Red Sox farm team) with them. The elders all came from Roccomonfina. These relatives are all from my mom’s side of the family but my dad’s family was from there also. We visited Roccomonfina in 2006. There were no Roccos there except for grave sites. We did maternal DNA tests on the Rocco branch.. Results were fascinating. My name is Mary and I live in PA.
Several of my relatives came to Rhode Island and Massachusetts from Roccamonfina and I am trying to find records and relatives. 2) Carmina Gallo, who was born 19 Nov 1879 in Roccamonfina. 3) Carmina Gallo’s parents were Giuseppe Gallo and Antonia DiPetrillo (born 1852)of Roccamonffina. 4) Antonio DiBiasio parents were Carmine DiBiasio and Maria (last name unknown) of Roccamonffina. I am looking for any information that might lead me to marriage dates, birth dates, and living relatives. Any help or guidance will be very appriciated. We would like to come visit and meet my relatives. Hi Eric….my dad’s family came from Roccamonfina. His sister was named Pasqualina and married a Gallo. I’ve been to Roccamonfina and met the Gallo family. It’s a very common name there but Maria Gallo (daughter of Pasqulina) married someone named Elviro Ferruolo and I met all of them. Lovely people that lived right in town in a nice little villa. My dad’s last name was Vento. All his relatives are in RI…Cranston, Providence, etc. Can you give me more information on the Gallo family? My grandmother was Rosa Gallo, daughter of Giuseppe Gallo and Antonia Martellini.She was born in 1888. She married Michele Maddalena in RI in 1907. I am trying to find out more information on my maternal side. My mom’s paternal grandfather’s name was Giuseppe Ferruolo, born in Roccomonfina on July 12, 1885. He was married (in USA) to Carolina Rocco who was born approximately 1880. Unknown where in Italy Carolina was born. On my mother’s maternal side, her grandmother Enrichetta Santagata was from Caserta. She was born on March 18, 1874. Her husband came from Misciano (Gaetano Gaito). Any little help would be greatly appreciately. I am interested in finding information regarding my 2x GGrandparents. Giovanni Grillo (Grello, Grelle) and his wife Maria Leonardo. Birth dates would be around the mid 1800’s. They had a son, Antonio Grillo who married Vittoria Saravo, also from Roccamonfina and immigrated to Lawrence, MA. Any assistance you can offer is greatly appreciated. I am looking for any information on Giuseppe Perrotta and his wife Elisabetta Feole. Their children were Raffaele b 1864, Sorafina b 1867, Antonio b 1875 & Gennaro b 1878. Any information on the date of birth, parents, siblings for both Giuseppe and Elisabetta would be helpful. Thank you. I believe my grandmother Cristina Antoinette Simone was born in Roccamonfina on September 12, 1912 to Vincenza Petteruti and Emilio Simone. Her parents emigrated to the United States, where they had four sons. I would be very grateful to find records of my grandmother in Italy and hopefully find living relatives as well. Thank you Sincerely. My Great grandfather Francisco Simone and his wife Emelia Zannini came to America in 1900 from Caserta, Campari, Roccamonfina. Anyone know them? I am looking for any information you can provide for the Melucci family. Pietro Cianci was born in 1871 in Roccamonfina, Campania, Italy. He married Carmela Tedesco in Roccamonfina 1892. My grandfather, Antimo Pelliccione was born in Roccamonfina. My father’s name was Vincenzo Pelliccione. My family and I visited in 1984 and met a family whose son was in medical school. His name was also Vincenzo Pelliccione. If anyone had information on this family, please contact me. My ancestors came from Italy. I have traced to Roccamofina an Edigio or Algitis DePetrillo who was born in 1898. He married Clorinda or Creolinda Decubellis who was also born in 1898. They emigrated to Massachusetts sometime before 1918, their first child, Nargentina who was my grandmother, was born in Lawrence, MA. There is also a Lorenzo Furnari who was born approx. 1855 in Santa Maria di Licodia, Provincia di Catania, Sicilia, Italy who is my forth great grandfather. I do not know who his wife was. her family, i.e occupation, history, etc. her brothers were Tommaso and Giuseppe. I will be visiting Roccamonfina italy in Setp. would be greatful for any information on clementina ruosi born dec. 10,1884 in carinola.she was the daughter of silvestro ruosi and angela alvino. thank you. I am planing a trip to Italy in April . I am looking for information on the Cianci family… My great grandfather was Pietro Cianci born in Roccamonfina in 1871 died in Rhode Island USA in 1935. I believe he was a carpenter. Any information would be wonderful . Looking for my great grandfather may almerindo depetrillo from roccaminfina. I m interested in starting a genealogy search. My grandmother was born in Roccamonfina. Her name was Michelin Amore. That ia all the information I have so far. Are you able to help, please reply. Hi, My Grandfather is Antonio Vuolo from Roccamonfina born 10/16/1882. My father’s first cousin was also from there his name is Gennaro Maria Prata Vuolo born 9/20/1923, he was an arch bishop in Boliva South America. I just wanted to find where my Grandfather’s brothers are. All I know is he has 3 brothers and at least 1 sister. Any chance if I came over there I could track their movement from Roccamonfina, Italy? Hello, Just found your message my husband’s grandmother was a cousin to Bishop Gennaro Maria Prata. Her name was Anna Prata (Paris). She married Ercole Paris from the same town Roccamonfina and they left Italy in 1960’s and moved to Rhode Island. Hi Lynn didn’t see this till now as I was looking for more information. My Grandfather’s sister married a Prada and they had the future Archbishop as their son. Small world. I wish there was more information though on my grandfather without going to Roccamonfina. There isn’t one surname of Vuolo left in the whole area as far as I can see. Thanks for the message Lynn. Hi, my father was born in Roccamonfina, Italy. His name was Antonio DePetrillo, or it could have been spelled DiPetrillo, my grandfathers name was Rafael DiPetrillo, my grandmothers name was Concetta DiPETRILLO I had an uncle whose name was David an aunt named Rose who became a Nun and moved to Rome. two other aunts that moved here to the USA LIKE MY father did.my father told me that they lived on a farm. I am researching my grandfather, Luigi Vuolo, who was born in Roccamonfina, Italy on October 2, 1897. He too was cousins with Gennaro, the Bishop who worked in Bolivia, who we knew very well. Luigi immigrated to the United States on March 28, 1912. He had several sisters and at least one brother which came over also. The sisters names were Ida, Nancy and Lucy, and there was a brother named Frank. I am going to ask a cousin who has more information. Feel free to get in touch if you want to chat or share any information you’ve discovered in the last 3 years! If you would like to start a research in Roccamonfina please send your request to roccamonfina@italianside.com.